Mike sent the following note to neighbors on September 6. Yesterday, a federal court underscored why it is imperative for Los Angeles to approve bridge housing and supportive housing for people who are homeless. In a unanimous ruling, the U.S. Ninth Circuit Court of Appeals said that it is cruel and unusual punishment for any city to prohibit sleeping on public property unless adequate shelter is available and accessible. This ruling applies to all of California and eight other states. What this means for Los Angeles is that we are faced with a stark and binary choice –provide sufficient housing and shelter where those who are homeless can access it, or allow people to sleep on public property, such as sidewalks. Providing housing and shelter has always been the right thing to do — but this ruling makes it a clear requirement. After decades of neglect and inaction, Los Angeles is finally starting to do the right and necessary thing. This morning, Mayor Eric Garcetti and my colleague Councilman Jose Huizar opened the first bridge housing facility built through the Mayor’s Bridge Home initiative (make sure to check out their inspiring video about the project here). This afternoon, the Homelessness & Poverty Committee is expected to approve bridge housing in Hollywood. The Department of Veterans Affairs is working with the city on bridge housing at its campus in Brentwood. And the mayor and I have proposed bridge housing in Venice. In every council district, the city will be approving hundreds of units of long-term supportive housing, and the city is finally investing in quick and nimble solutions, like shared housing and reunification. Whether you want to end the human misery that is our homelessness crisis, or whether you want to eliminate encampments in our neighborhoods, the course of action is the same. 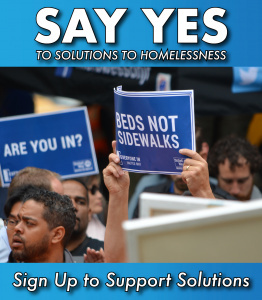 We need to say yes to bridge housing, supportive housing, crisis housing, shared housing, safe parking, and more. We need every community in Los Angeles to say yes to genuine solutions. If you are willing to support solutions where you live, please let us know below by completing the form below. Working together, we can solve this problem.